Is New England The Right Fit For Tim Tebow? : The Two-Way He led the Denver Broncos to the playoffs two seasons ago, then sat on the bench last year with the New York Jets. Now he's set to back up superstar quarterback Tom Brady. Might that be just the right job for Tebow? 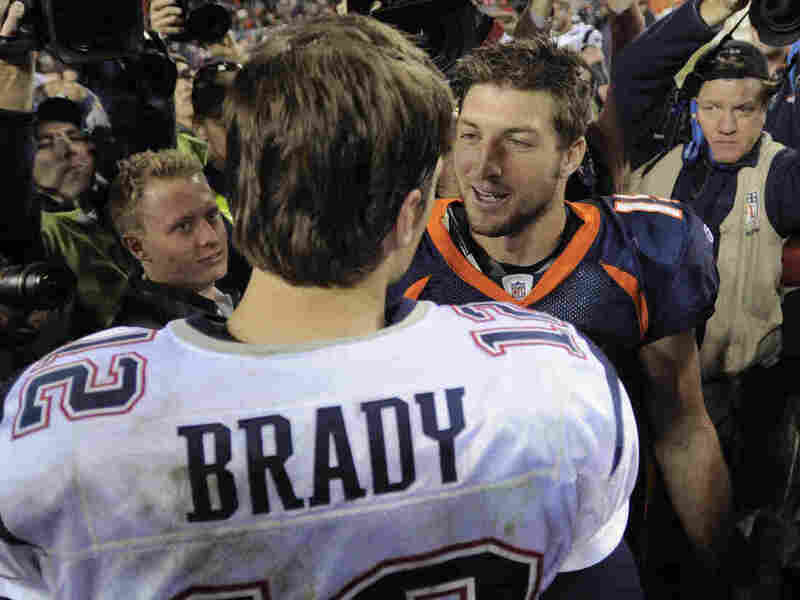 Tim Tebow (right) shakes hands with New England Patriots quarterback Tom Brady after the Patriots defeated the Broncos on Dec. 18, 2011. Now, they're due to be teammates. The New England Patriots' website just confirmed the news that quarterback Tim Tebow is joining the team. So the stories by NFL.com, The Boston Globe, ESPN and others are true: The player who captivated many football fans when he played for the Denver Broncos during the 2011-12 season, but then was stuck on the sidelines for most of last season with the New York Jets, has found a new place to play. USA Today offers "five reasons why Tebow in New England is a good idea." We think the most important one is that there won't be any pressure on the 25-year-old Tebow. As the newspaper says, the Patriots' superstar quarterback — Tom Brady — "isn't coming off the field unless he's on a stretcher." Even many of Tebow's biggest fans will agree that he hasn't yet shown he has the skills to be a typical NFL starting quarterback. So, what's the verdict on this latest news?